On the Buncombe Turnpike, the road hogs were real swine. One of the descents is like the roof of a house, for nearly a mile … I rode, I walked, I sweated, I tumbled, and my old knees failed. Here are gullies, and rocks and precipices, … bad is the best. These primitive roads inhibited mobility and consigned inhabitants of the western counties to lives of social isolation and subsistence farming. There was simply no sense in producing beyond what the family could consume because there was no way to transport the surplus to a market where it could be turned into cash. In Buncombe County, progressive citizens proposed a remedy: The Buncombe Turnpike. In the early years of the 19th century, Buncombe County was a sprawling territory that included twelve current mountain counties. In a nod to its size, it was often called The State of Buncombe. The county’s largest population center and its commercial hub was the city of Asheville. 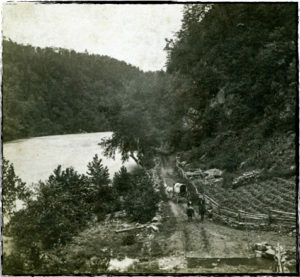 Passing near the city, the “Drover’s Road” took advantage of relatively flat land along the French Broad River to offer a route over which livestock could be driven to markets in South Carolina. But even on this well traveled road, such commerce was rendered difficult by rugged topography, rocky roadbeds, and limited river crossing points. In 1824, recognizing the commercial potential that an improved market road would hold, several prominent Buncombe citizens incorporated the Buncombe Turnpike Company. The petitioned for and received a state charter to improve the road as a revenue-producing toll road. As was the custom of the era, the project would be accomplished entirely with private investment. The Buncombe Turnpike not only jump-started the economy, it transformed the region in ways few had foreseen. When the Buncombe Turnpike was completed in 1828, it ran seventy-five miles from the NC/SC border near Greenville SC to near Warm Springs (now Hot Springs) NC, where it joined the Tennessee Road. The turnpike was arguably one of the best roads in the state, and it quickly had a positive impact on the region. Livestock production increased as access to outside markets became easier. Along the turnpike, a service industry grew up to cater to the needs of the drovers and their animals. Merchants in the region could now import goods for local sale. Regular mail service became possible. And stage coaches began bringing tourists from the flatlands, the birth of what would become a vital industry for mountain counties. With horses, mules, hogs, sheep, ducks, turkeys and geese being driven down the road to market, inns catering to them blossomed along the road about a mile apart. An inn with a stock-stand might accommodate several drovers and 20,000 animals at night. At these facilities, the drovers could rest overnight, their animals could be fed (stimulating corn production all along the route), and payment could be accomplished by leaving some number of animals with the proprietor. A number of these individually owned inns evolved into places: James Mitchell Alexander’s inn became Alexander, NC; Hezekial Barnard’s inn became Barnardsville; Samuel Chunn’s inn gave his name to Chunn’s Cove; and Zachariah Candler’s inn became the town of Candler. 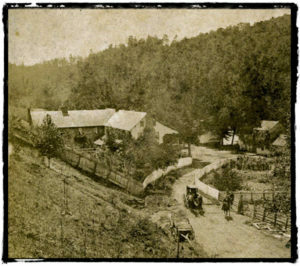 Many of the entrepreneurs who established inns along the Buncombe Turnpike became wealthy, leading citizens of the region. 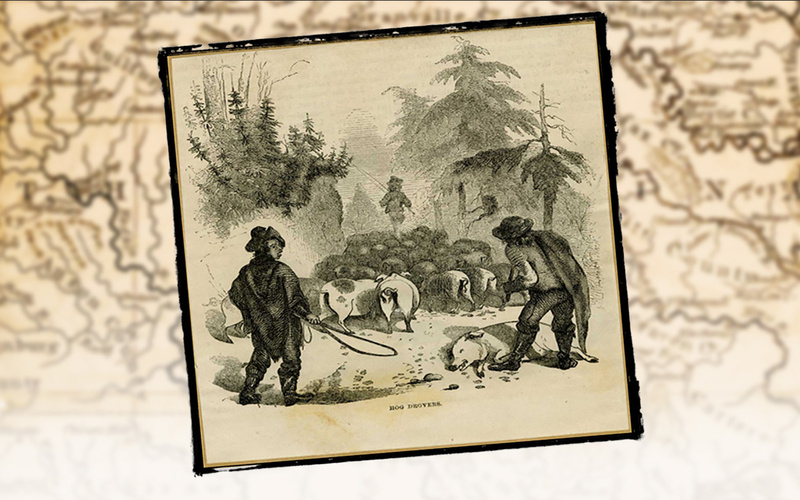 One of the wealthiest was James Smith, who operated an inn and stock-stand just west of downtown Asheville. At that site, Smith also owned and operated a main ferry across the French Broad River. Smith replaced the ferry with a wooden toll bridge in 1834, and the wooden bridge later gave way to one of steel. A working bridge stands at the site today, just south of the twin-span Interstate 26 bridge. As with any far-sighted project, there were those who took a dimmer view. 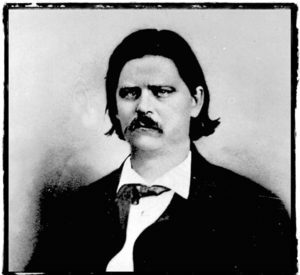 In Asheville, Zebulon Vance had reservations that were less visionary and more olfactory. Not surprisingly, on the Buncombe Turnpike not everything smelled of roses. Each year between October and December, with as many as one hundred seventy five thousand hogs parading down the main street of Asheville on their way to market in South Carolina, the sweet smell of prosperity had a pungent side too. The rain continues to fall, and our streets are almost impassible with the mud, and thousands upon thousands of hogs moving through the town adds to the general filthyness of everything around. But to most people, the hogs simply smelled like a financial opportunity to be wallowed in as the Buncombe Turnpike energized the economy and transformed the region.